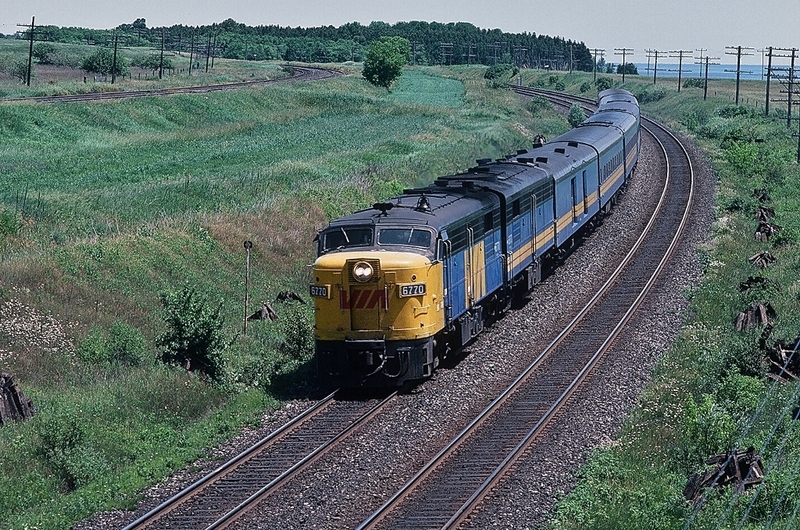 Railpictures.ca - sdfourty Photo: Time machine: CN Kingston Subdivision mile 284.3 at the north track Restricted Clearance Sign*, two images, three decades of separation, three generations of (Via) diesel power, same high speed super-elevated curve. (* Restricted Clearance Sign: two diamond shaped holes ) The October 10, 2013 image: A friendly wave by a Via head end crew member completes the image of an unusual two generation Via power lashup – 1986 GMD built F40PH-2 #6401 (rebuilt 2011/2) leads 2001 GE built P42DC #911 – for Via train #61 at CN Kingston Subdivision mile 284.3; the Stephenson Road bridge. October 2, 2013 image by S. Danko. The June 25, 1983 Kodachrome: combined train Via #43 The Capital / #53 The Lakeshore, powered by first generation 1959 built MLW FPA-4 #6770 and an unknown FPB-4 #68xx with the standard conventional blue and yellow striped 1954 era passenger equipment consist, speeds through the high speed super-elevated curve at mile 284.3 The Lakeshore Road / Stephenson Road Bridge: VIA 41 with 6425 scoots under the Lakeshore Road bridge *(the reason for the Restricted Clearance Sign) mile 284.3 Kingston Subdivision. 03/13/13 image by S. Danko. The Bridge The competition in both images: in the background that is CP Rail Belleville Subdivision mile 155 known as Lovekin, Ontario. Images and Kodachrome by S.Danko. | Railpictures.ca – Canadian Railway Photography – photographie ferroviaire Canadienne. The October 10, 2013 image: A friendly wave by a Via head end crew member completes the image of an unusual two generation Via power lashup - 1986 GMD built F40PH-2 #6401 (rebuilt 2011/2) leads 2001 GE built P42DC #911 - for Via train #61 at CN Kingston Subdivision mile 284.3; the Stephenson Road bridge. October 2, 2013 image by S. Danko. VIA 41 with 6425 scoots under the Lakeshore Road bridge *(the reason for the Restricted Clearance Sign) mile 284.3 Kingston Subdivision. 03/13/13 image by S. Danko. The competition in both images: in the background that is CP Rail Belleville Subdivision mile 155 known as Lovekin, Ontario. Images and Kodachrome by S.Danko. Excellent execution! Added to the Time Machine page as a result. A-B of FPA/B4′s and a matched train of blues, far more interesting than the current day equipment. Excellent as always, Steve.